The award-winning hands-free drinking system. Hang it, hook it, clip it – almost anywhere. Take it with you everywhere. Designed to ensure you stay hydrated at all times – wherever you are. Keeping you hydrated – even when your hands are tied. Dehydration is the biggest single issue in healthcare, and one of the main causes is the lack of easy access to fluids for people with limited mobility. Those recovering or receiving care in hospital, a hospice or at home who are unable to reach, lift, or hold drinks without help are at risk of dehydration. 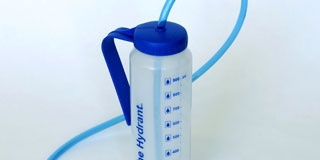 The Hydrant refillable water bottle solves the problem for healthcare staff, carers and patients, simply by closing the gap between the drinker and the drink. 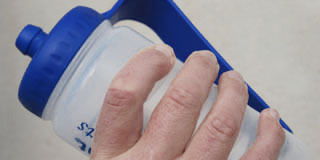 For patients, it delivers independence and dignity for those who would otherwise struggle to stay hydrated. It allows carers to accurately measure fluid intake and frees up more time for them to care for patients in other ways. The unique, patented, award-winning Hydrant water bottle clips, hooks or hangs using the brilliantly simple one-piece cap/hook/handle. It attaches to beds, chairs, wheelchairs, bikes, pushchairs, drip stands…virtually anywhere, solving a massive issue in a low-cost way. Owner and designer Mark Moran created the Hydrant range having experienced the effects of dehydration both as a patient and an endurance runner. The award-winning Hydrant hooks, hangs or clips to almost anything – closing the gap between the drinker and the drink. The most convenient way to stay hydrated on the move. This product is designed so you can drink from the bottle or hands-free. The full Hydrant range, plus accessories, is available to buy online. 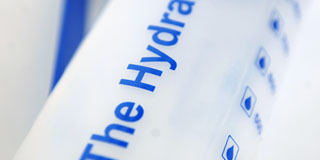 Keep up to date with all the latest news and information from Hydrate for Health, and be one of the first to hear about any new or improved service. 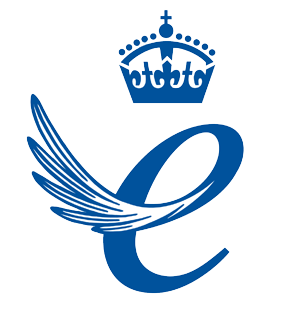 Simply 'like' our Facebook page by clicking the link below.